You are here: Home / ABOUT / What is Montessori? Created almost 100 years ago, the Montessori method is the fastest growing educational system in the world. 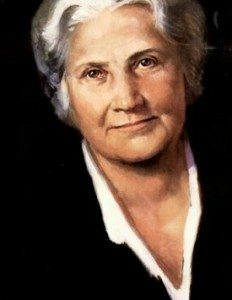 It was developed by Dr. Maria Montessori, the first female doctor in Italy and a renowned professional who made great strides in the fields of psychiatry and pediatrics. Dr. Montessori believed that every child possesses an innate curiosity and love for learning which takes them on a “journey of discovery” in the classroom. A Montessori education produces independent, confident children who are self-sufficient, environmentally conscious, emotionally balanced, globally aware, and respectful of self and others.